This Oceanfront Condo has an amazing view. It has a gorgeous Great Room and a beautiful fully equipped kitchen. With the roar of the ocean just a few yards away, you will not want to leave the Lanai after relaxing on the Tropitone furniture. This Condo has a beautiful little sandy beach right in front of your Lanai. This is rare on the Big Island. There are plenty of 'World Famous Beaches' just a few miles away. This is a spectacular property designed by award winning architect Vladimir Ossipoff. It incorporates many features that are his trademark, such as screened full-length louvers throughout to provide flow-through ventilation a large open lanai, and sliding glass doors and screens that completely hide in a pocket leaving the entire kitchen and great room open to the Lanai. This is a private complex with only six units. It is about 2 miles to the center of Kailua-Kona Village. Location! Location! Location! We are right on a beautiful small sandy beach with tide pools full of fishes, turtles and gorgeous sparkling water. It is great too just to look at all day and so much fun for the kids. The sunsets are also spectacular. No crowds because the beach access for the public is about 1/4 mile away across Lava. You can sit on the Lanai and see spinner dolphins go by all year and whales when they are in season. Beautiful Granite Counter Tops, Bright and Sunny, Windows ! Full kitchen overlooking the Ocean. We are very particular and make sure you have very nice linens and everything in the unit is in great condition. This is a second home for us so we are here frequently checking on everything and replacing anything that looks worn. We know how precious vacations are and we want you to have a beautiful place to stay. We had a great time at this property! It was close to everything and comfortable beds! Very clean, comfortable beds, great pool, amazing view, close to everything! Thank you for letting us stay here. This unit in Kona was one of the best I've rented anywhere in the world. When I spoke to the owner, Joanna, she told me it was their home away from home and it became ours for a week. We went to sleep to the sound of the ocean and woke up to our personal view of paradise. The spaciousness, cleanliness, and convenience made our stay enjoyable and relaxing. Furniture, linens, kitchen were all new and well-cared for. We had everything we could possibly need and then some. 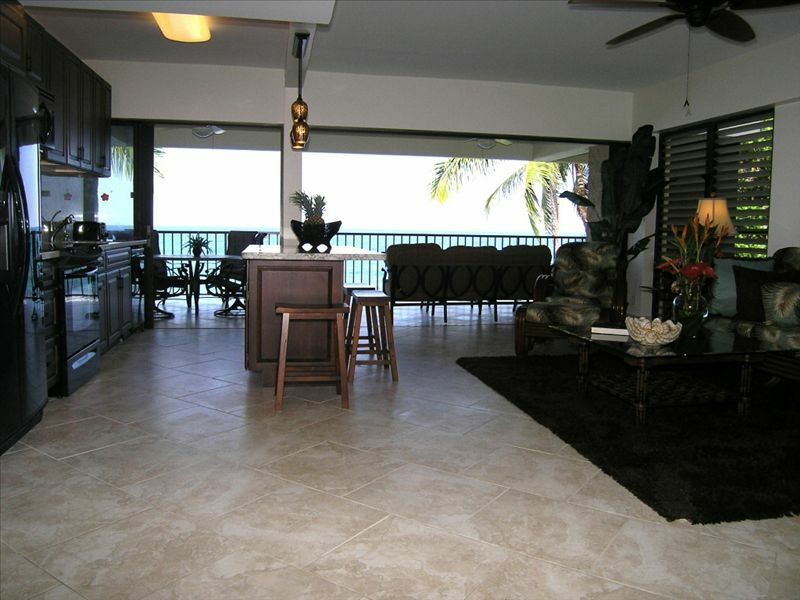 We would recommend this condo without reservation to anyone who wanted a true Hawaii experience. We had 2 small problems which doesn't change our opinion - the pool was out of service 3 of the 7 days we were there and there was an issue of the key "disappearing" after we left it on the counter. The pool issue was not the fault of the owners or maintenance and I'm confident the key issue will resolve itself. I know you will enjoy your stay as much as we did ours.I would recommend it for a romantic trip or for a family with older kids. This condo really is as stunning as it looks. Very clean, everything feels very new, remarkable view with a great Kona location. The construction is unique because several of the wall are screens with horizontal louvers/shutters that allow lots of fresh air and natural light in every room when opened. My boyfriend thought it was the best place we had ever stayed in Hawaii. I truly enjoyed the fact that it was a small complex on the ocean with a beautiful kitchen, furnishings, and it felt very private. Aloha Charmaine, We are so glad you had a great time. The condo is truly amazing and so are all the wonderful people like you. We are having so much fun being part of all our guests vacations. After working 30 years I know how precious vacations really are.We want the one you spend with us to be the best. The best family vacation ever ! This condo is fantastic, with stunning ocean view of sunsets, dolphins, whales, turtles and rare hawaiian seal. The lanai was a dream, with comfortable furniture so every breakfast was fresh fruit and watching the waves pounding the lava/sand beach. From the lanai looking down is the beautiful large swimming pool then thru the gate you are on the lava/sand beach and walking to the cove to see the sea turtles. The beds were, to die for, comfortable. Cool tile floors through-out and spacious windows are floor to ceiling high making the entire condo pleasant. Loved the large walk-in showers, enough room for two. Kitchen was outstanding with state of art appliances, marble countertops and the quietest dishwasher made. The living room is tastefully furnished so just enjoy the peace of reading a book with the sounds of the waves coming in from the spacious sliding door to the lanai. When you plan your visit don't make my mistake... and stay only 7 days. Our next visit at least two weeks, this place is that nice! You are so kind and very complete with your review of our condo.We just love it and have tried to make it as perfect as possible for everyone who is our guest.We are always working to keep everything fresh and new, if it doesn't look perfect we replace it. We will look forward to your next visit with us. Thanks so much. The cleanest, warmest most beautiful ocean in the world. Amazing snorkeling/scuba diving,kayaking and swimming. There are plenty of 'World Famous Beaches' just minutes away. The Golf Courses are also World Class , many have ocean views and some line the Oceanfront. The Weather is Beautiful , Warm Balmy evenings to enjoy a sunset from the Lanai. You will have way more things to do on the Big Island. It is Paradise.